Hitting the ground running. With the first 12 Epilepsiome gene reviews up, we want to provide you with a brief update and what we have learned from the experience in the last few months. A number of the new Epilepsiome members have asked us how exactly the gene review process will work and what we expect from them. Here are some of the questions you’ve posed and our answers. What is our vision of the Epilepsiome? We would describe the Epilepsiome “vision” in the following ways: We would like to provide accurate and expert information on genes that cause human epilepsies by providing a platform for the epilepsy genetics community. Our goal is to have an up-to-date gene review for every relevant gene, provide information for known variants in these genes and have an ongoing discussion about each gene. What is the Epilepsiome cycle? 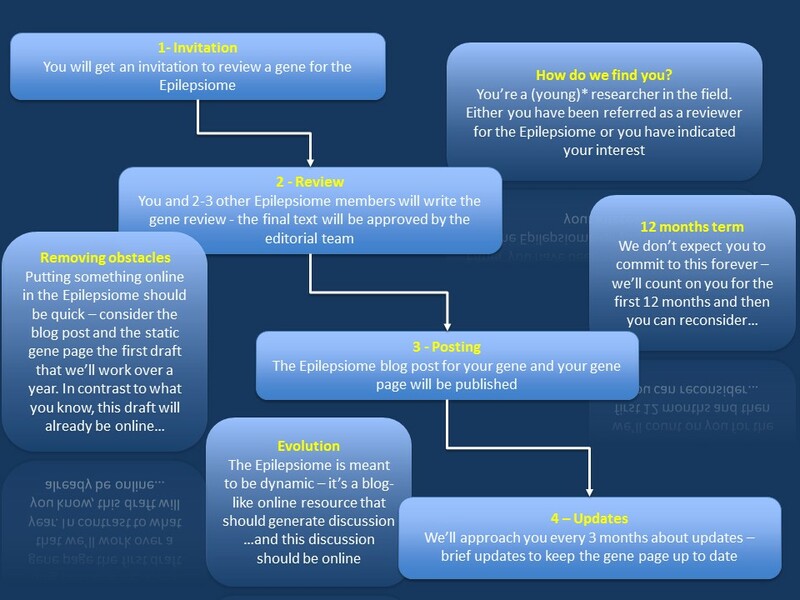 The Epilepsiome is not a static resource – it is built as part of a blog that will provide the community with ongoing information about what is happening in the field of epilepsy genetics. Our idea for introducing and adding information about genes is as follows. Monday is the day for gene reviews. This is usually the time during the week when we will introduce a new gene. Updates for existing gene reviews will usually be announced in a brief paragraph on Fridays (3-4 sentences). Wednesday will stay as the day for regular blog posts – these posts will include reviews of relevant publications, opinions, or blog posts about our motivation and lives as scientists. It will take awhile to have every relevant gene reviewed, but many genes are already mentioned somewhere on the blog. Look for them using our search function. How do I become an Epilepsiome reviewer? You have either indicated interest or you have been suggested as a reviewer by one of your mentors. There is an asterisk next to the “young” on the figure that should indicate that we don’t look at your “biological age” when asking you to review a gene. If you’re not in our reviewer database yet and would like to contribute to the body of knowledge that we are currently building, please register here. Epilepsiome reviewers work in teams and we usually have 2-3 reviewers per gene. In most cases, one of the Epilepsiome reviewers becomes the “team leader” who takes on the responsibility to coordinate the writing of the draft. What do I need to do as an Epilepsiome reviewer? First, you’ll get an invitation and the template that you can use to write your review (500-600 words). You’ll get access to our templates for the Epilepsiome figures and all previous blog posts. We’ll ask you to write the “static gene page” and provide 1-2 figures that are not copyrighted. Remember, we’re in 2015 and the most relevant things online are not copyrighted. There is no copyright on any of the information on the Epilepsiome and all the information is shared using a Creative Commons BY license. Secondly, once you have provided us with a gene review, we will put this through a brief review process. We’re thinking about a quick peer review process, but we’re not quite there yet. As a third step, we’ll put together a blog post that announces the gene review and publish both the blog post and your gene review. As a last step, we’ll ask you every three months about updates about your gene. These updates will be integrated into the gene review and posted as a Friday update. What is Phase II? There are genes and there are variants. The overall goal of the Epilepsiome is not only to review genes, but also to provide information about the causative variants in these genes. This effort is only starting and will be coordinated with the major initiatives in the field such as ClinGen and ClinVar. We don’t expect you as an Epilepsiome reviewer to take care of all this for the genes that you are involved in. The Epilepsiome will get professional staff at CHOP and Seattle sooner or later who will take care of this and ask for your expert opinion with regards to specific questions or concerns. For now, Phase II (as we would like to call the variant collection) is slowly gearing up and plans for this are only emerging. How does the review work? The more I think about the Epilepsiome, the more I realize that we need a formal review system. Formal should not mean complicated, it should simply mean that the steps on how the initial drafts are reviewed and collected are happening in a systematic fashion. This is what we owe you as Epilepsiome reviewers. Your effort should be rewarded through a professional review process. We are getting there, though. With Casey on board, we now have a coordinator for our gene review process and she has done a wonderful job since July to keep us on track. We’ll try to streamline this even more in the near future. How much time will I have as a reviewer? We’re getting better in working out the kinks of our system. We’ll try to let you known 2-3 months in advance. However, in contrast to other publication formats, the Epilepsiome only tolerates minor delays – we are working on a tight blogging schedule. Rather than delay and try to come up with a perfect gene review, just send us what you have. 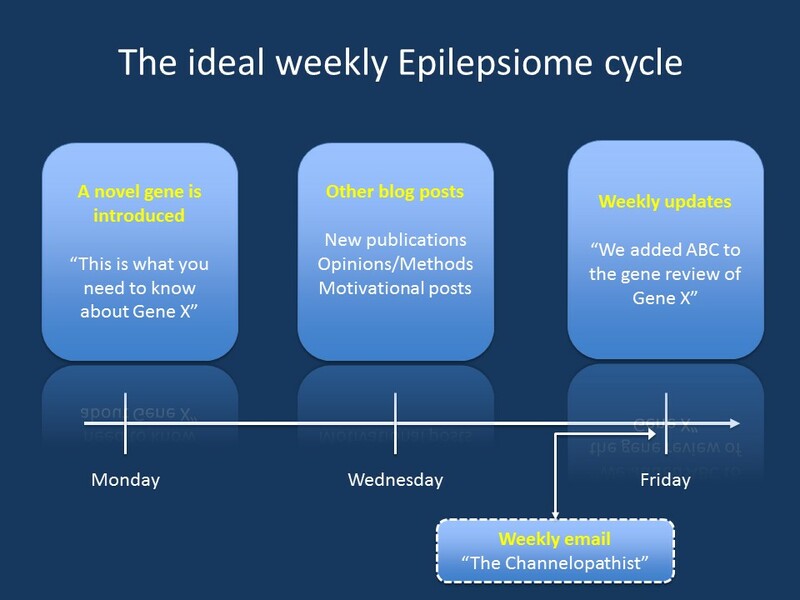 The process of refining the post and adding more data will be part of the ongoing Epilepsiome cycle and we want this discussion to happen out in the open online rather than behind closed email doors. Updates? Remember, the Epilepsiome is meant to be dynamic. Rather than a perfect text to start with, we want you to be part of the Epilepsiome community that will modify and expand the gene review over time. You will get a reminder from us every three months. Updates that mention you as the reviewer who added this information will be mentioned in the Friday posts and you will be mentioned as part of the gene team on the “static gene page”. Updates usually involve a few sentences that you would also put into an email. We will format this for you and put this online. This entry was posted in Epilepsiome and tagged epilepsiome. Bookmark the permalink.